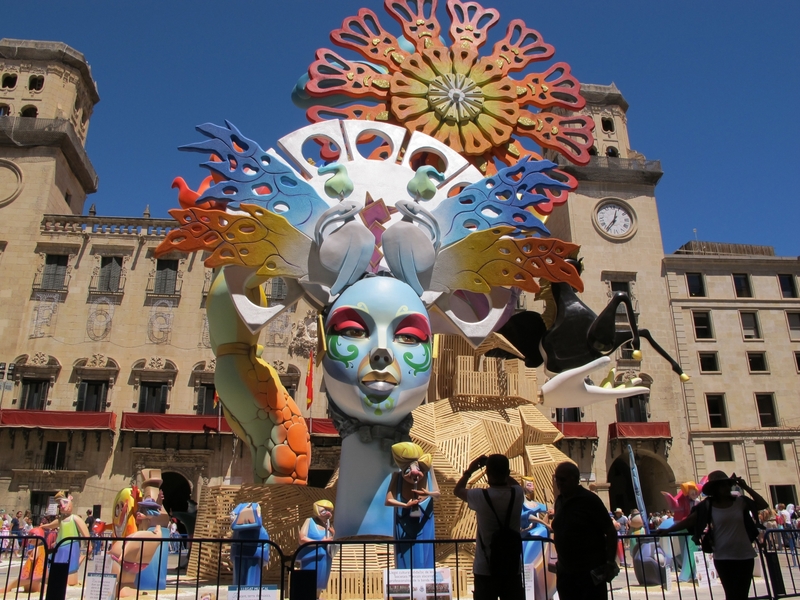 Enjoy the summer solstice with bonfires on the beach, beautiful satirical statues and noisy firecrackers in Alicante. This is the most important celebration, beginning on the 20th June and lasting until the 29th. It is a festival dedicated to fire, including events such as the proclamation (The Pregon), setting up of the bonfires (the Planta), the procession of the effigies (Cabalgata del Ninot), parades and processions in different districts of the city and the main event on the 24th June, the feast day of Saint John the Baptist, when large satirical statues made of cardboard and wood are set alight. 19:00 – Entry of Bands and Commissions. Tour: Plaza de los Luceros, Alfonso X El Sabio, Rambla de Méndez Núñez, Calle Altamira and Plaza del Ayuntamiento. 14:00 – Mascletá. Plaza de los Luceros. 14:00 – Mascletás competition. Plaza de los Luceros. 00:00 – Plantá of Children’s bonfires and ‘XXI Contest of Ninots to the carrer’. 00:00 – Plantá of Hogueras and Barracks. At midnight, dinner to recover forces with bacores and ‘coca amb tonina’. 08:00 – Awaken in all districts fogueriles. 19:00 – I Session of Flower Offering. Route: Luceros Square, Alfonso El Sabio, Rambla de Méndez Núñez, Calle San José and Plaza de Abad Penalva. Concatedral de San Nicolás. 22:00 – Verbenas in Racós and Barracks. 19:00 – Second Session of Flower Offering. Route: Luceros Square, Alfonso El Sabio, Rambla de Méndez Núñez, Calle San José and Plaza de Abad Penalva. Concatedral de San Nicolás. 13:00 – Pasacalle of ‘Nanos i Gegants’ from the Town Hall Square to the Plaza de los Luceros. 21:00 – International folklore parade. Route: Luceros Square, Alfonso El Sabio, Rambla de Méndez Núñez, Calle Altamira and Plaza del Ayuntamiento. 00:00 – Shot of the monumental palm tree from the summit of Monte Benacantil. 00:00 – Crema of the official Foguera and crema of the rest of fogueres in each of the districts of the city.